Extremely versatile! Dress them up or down. Sparkly Changeable pendants are made with exquisite Swarovski Crystals! They come in 4 sizes and various designs and color options. 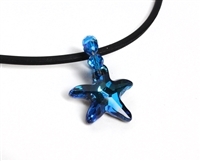 You can buy a matching changeable swarovski crystal necklace to really shine, keep it on the black chord, or slide it on your own necklaces. They all reflect rainbows when the light shines on.